As a leading provider of text-messaging solutions, and one of the UK's largest innovative SMS aggregators, aql was keen to develop a unique talking point using it's messaging products. It was decided to light their main corridors in their new 30,000 sq foot premises in Leeds with RGB colour changing fixtures and to provide control of these by SMS text message to employees, customers and visitors. 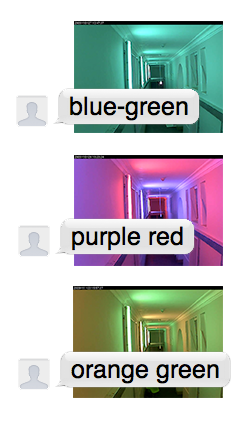 Simply by texting a colour, or colours, of their choice to a telephone number the lights will change to represent that colour. There are a few special effects and animated sequences available too. Fluorescent Martin Architectual Cyclo 03 IP65 fixtures were chosen for the installation for their proven reliability and low energy consumption and running costs, control is provided by a custom-designed bespoke networked controller which outputs Art-Net data which is then converted to DMX for the fixtures. The decision to use IP65 fixtures for an indoor installation was made as they are in keeping with the 'industrial' look and feel of the building, resembling traditional bulkhead fluorescent lights. and invited visitors to the website to control the corridor. a few snapshots are shown to the right. If you have a creative idea for a unique way to use lighting please get in touch.